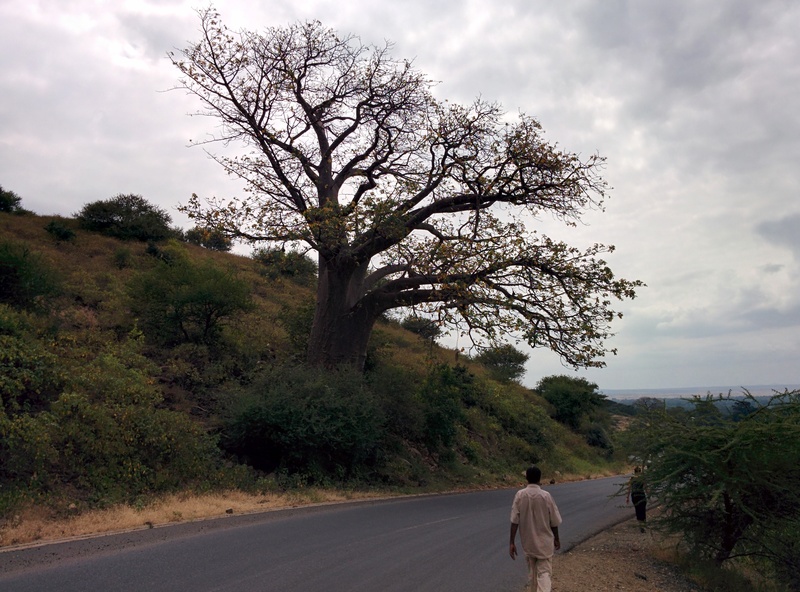 In the summer 2014, before joining a great volunteering programme (Insight by the Irish NGO Development Perspectives, which I described here), me and Bara spent two fantastic weeks exploring the north of Tanzania. The country is so beautiful and rich that the hardest part is to choose what to see! 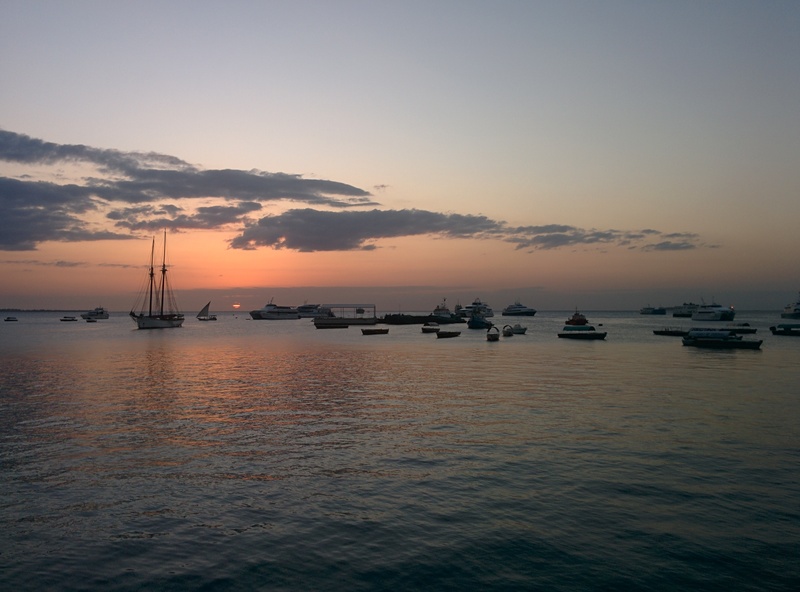 The Kilimanjaro, the fantastic natural parks, Lake Victoria, the sea… it really is one of the most interesting places in the world. 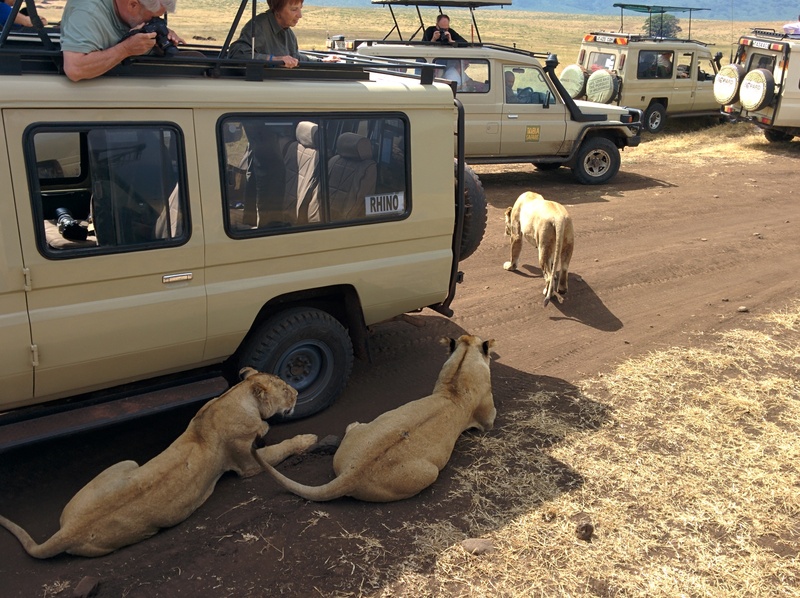 We opted for a three days Safari in the north, starting from the city of Arusha and visiting the Serengeti area, and the Ngorongoro Natural Park. In total, approximately 500 km for 3 days and 3 nights. 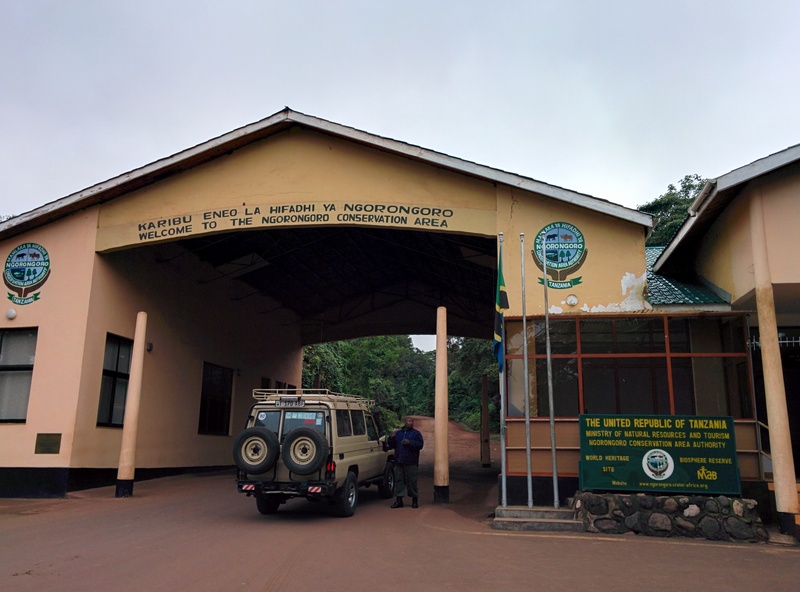 We spent 300 USD per person (in 2014), with camping, tents and sleeping bags provided, and food included (which was fresh and abundant: packed lunch and dinner cooked for us at the campsites). The fee doesn’t include the tips to the guides, though, which is almost obligatory and not really just a courtesy: it’s the biggest form of income for your guides, and if they worked hard and well to give you a great experience, they really deserve a bonus. 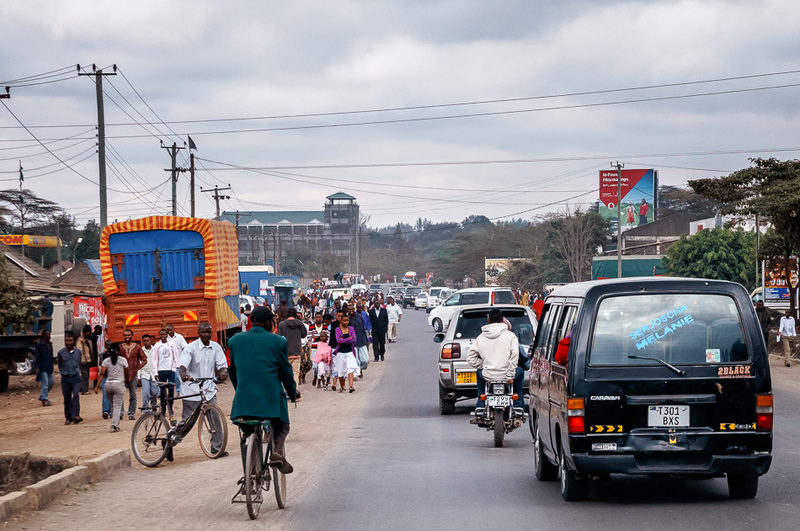 Arusha, our starting point, is not a very interesting place in itself. Just a medium sized city, which bases most of its activity on tourism. 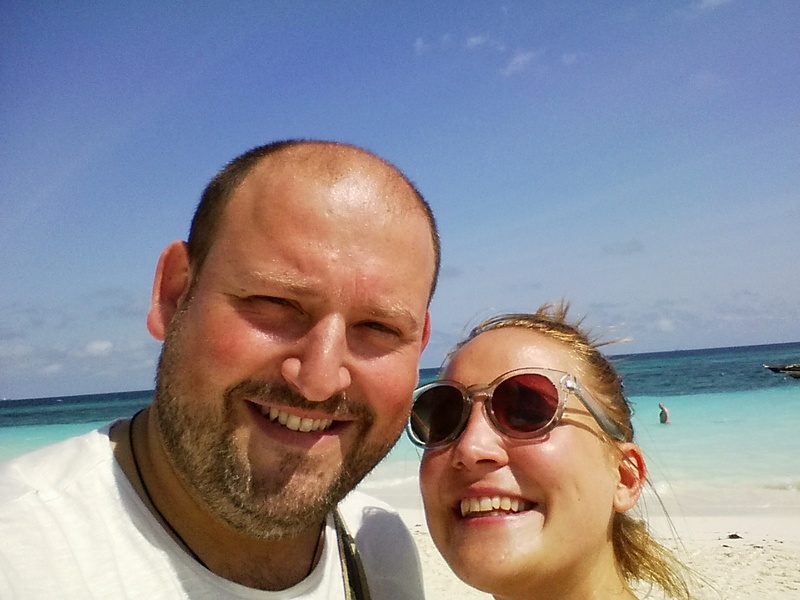 As soon as we arrived, even as experienced travellers, we stood out like a sore thumb. Almost everybody in the city is somehow connected with the tourism business, and if they are not, they know someone who is. We decided not to book in advance and not to involve any of the fancy tour agencies. Instead, we wanted to organise our own self-made trip with the help of local people and guides. It’s a bit more complicated, takes time, and the risk is to be conned and to lose your money. But it’s certainly possible. For us it was quite a smooth experience. 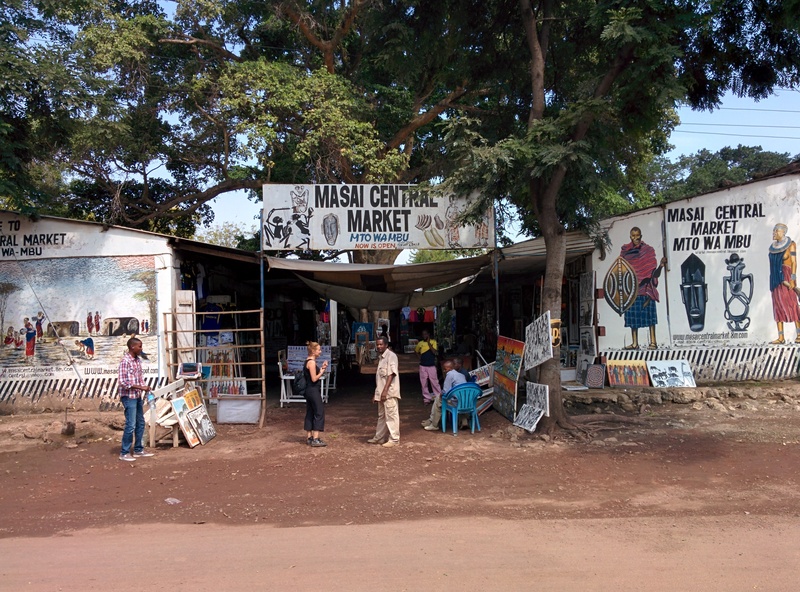 Just a few questions in town, and we were pointed in the direction of several agencies organising Safaris (it’s maybe worth noting that “Safari” is a swahili word meaning “Journey”). One advice: don’t stop at the first shop! Check a few offers, compare options, always be polite, say what you are expecting from the experience, and don’t be shy when talking about money. Try to bargain but understand what is realistic. The local agents will make it very clear if your expectations are out of place. Otherwise, will do everything they can to accommodate your specific requests and turn you into their happy customer. In our case, we joined a group that was already on the road since the day before. 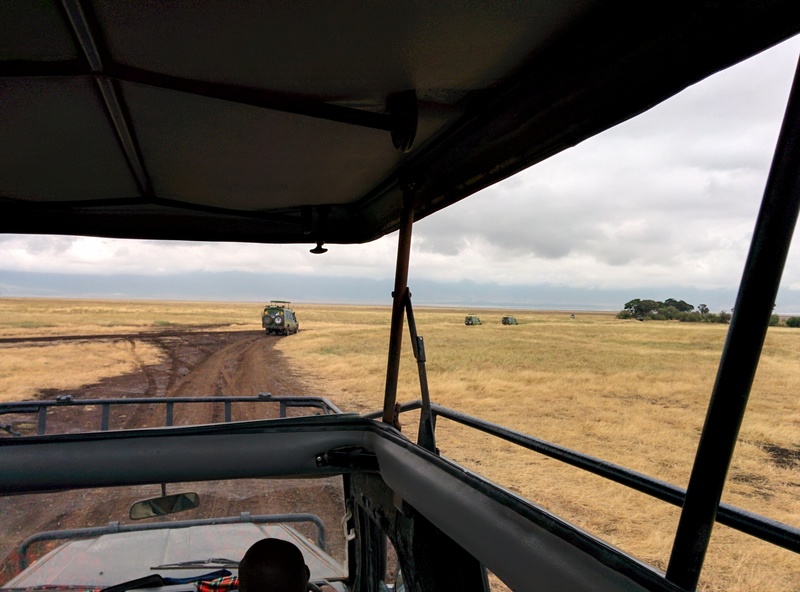 We met them and went to the Serengeti national park, and to the Ngorongoro conservation area. All in all we had three very intensive days, spent for the most part on the road, in our jeep. But it was absolutely memorable. We were travelling with our guide and a cook, and they really did everything they could to make our experience great. Not unique (as we will see), but great. The first part was a long road trip, mostly on deserted dirt roads, with the only company of long distance trucks. 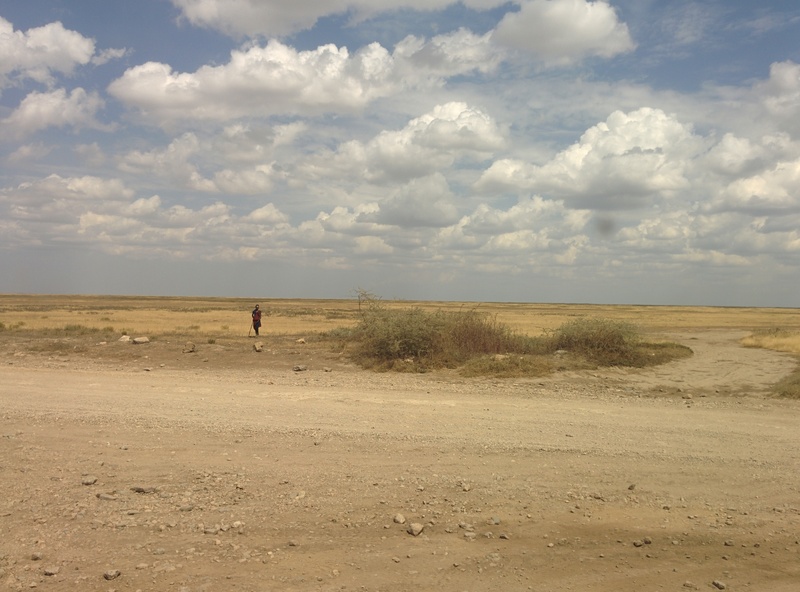 Nothing really exciting, except the view of the Savana and the occasional Masai observer. 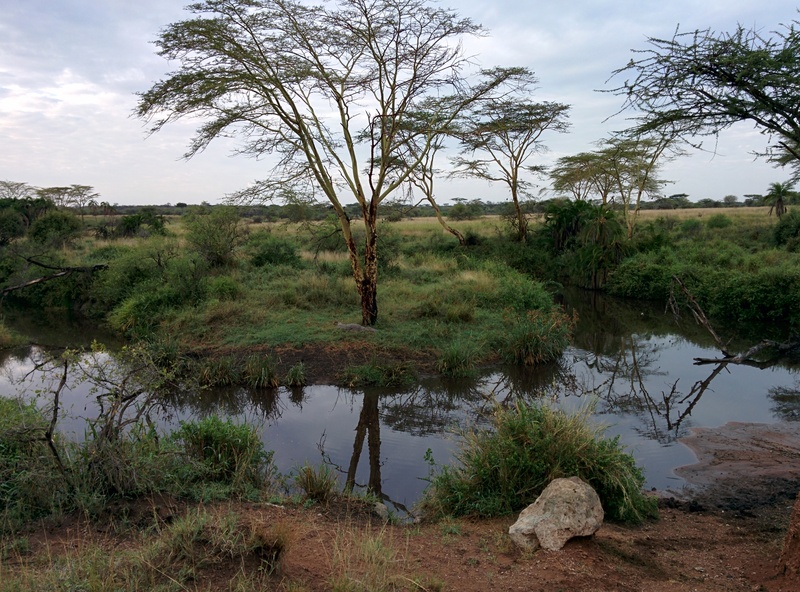 At the end of half a day of travel, we got to the beginning of the Serengeti area. 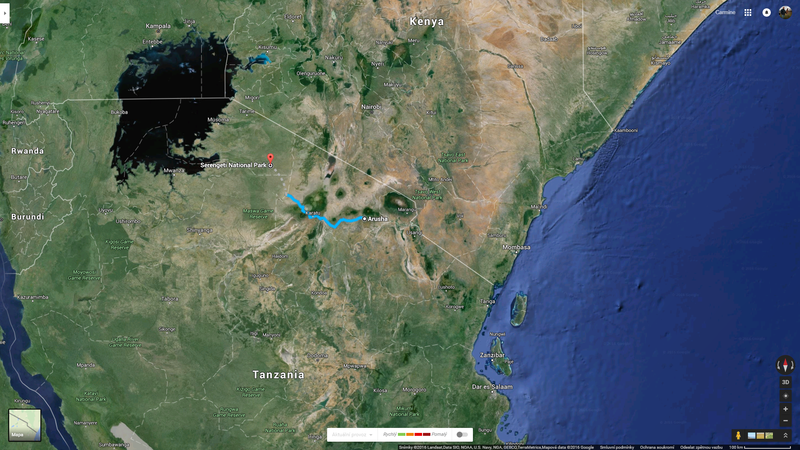 It’s a vast area, approximately 30,000 km2, roughly spanning from the lake Victoria eastwards. 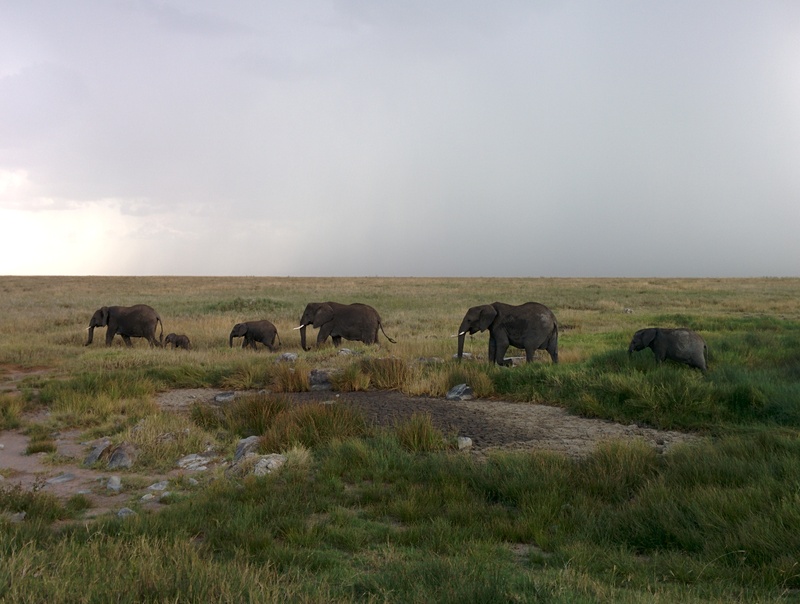 It is enormously important because it hosts the largest terrestrial mammal migration in the world. 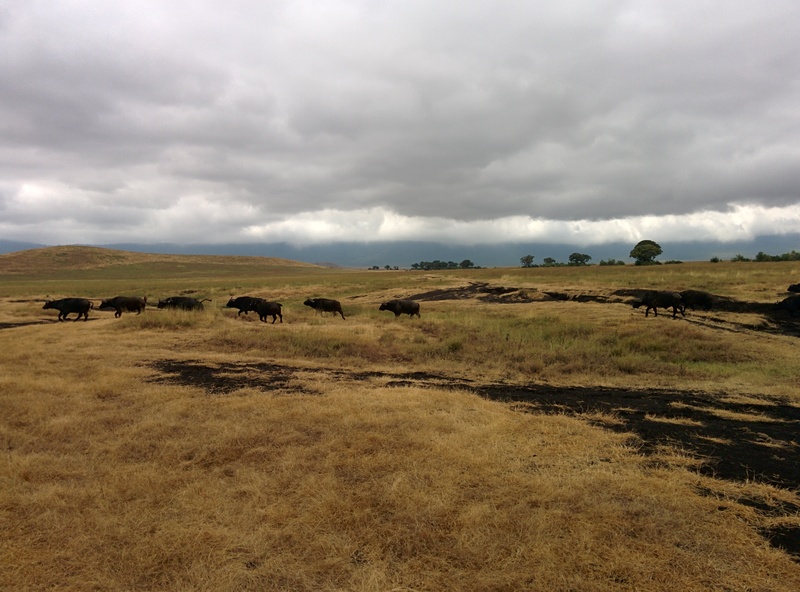 Hundreds of thousands of animals move following water and grazing, in a circular migration between Tanzania and Kenya. 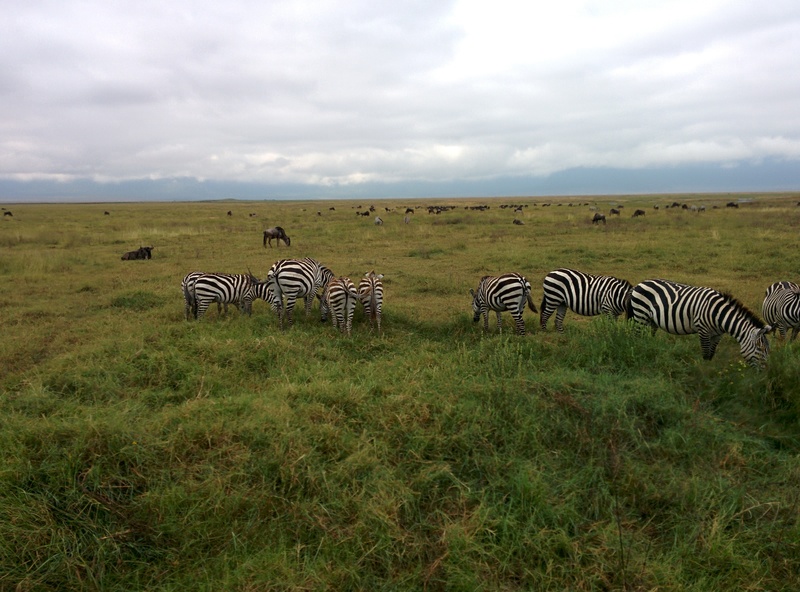 Zebras, wildebeests and gazelles are the most common, as well as giraffes and elephants, and over 500 bird species. And of course, all the predators and carnivores which couldn’t be happier with so much abundance. Enough, if you want to know more, read the wikipedia page (as I did of course, just before writing this). 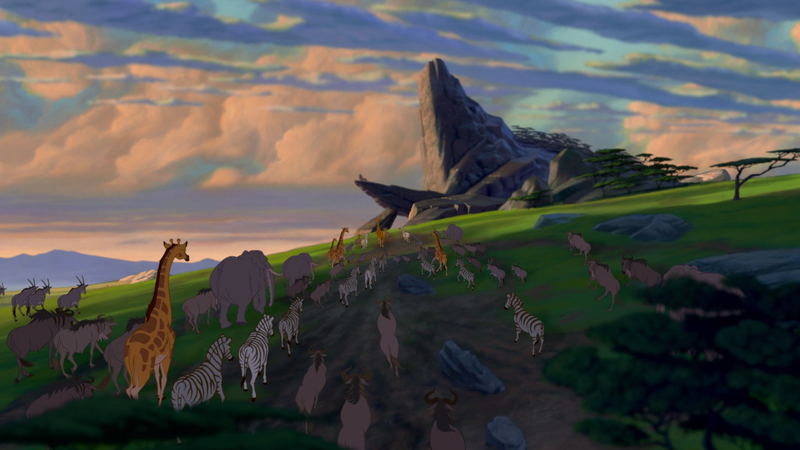 A nice discovery was the fact that the names in “The Lion King” are actual swahili animal names! “Simba” means “lion”. 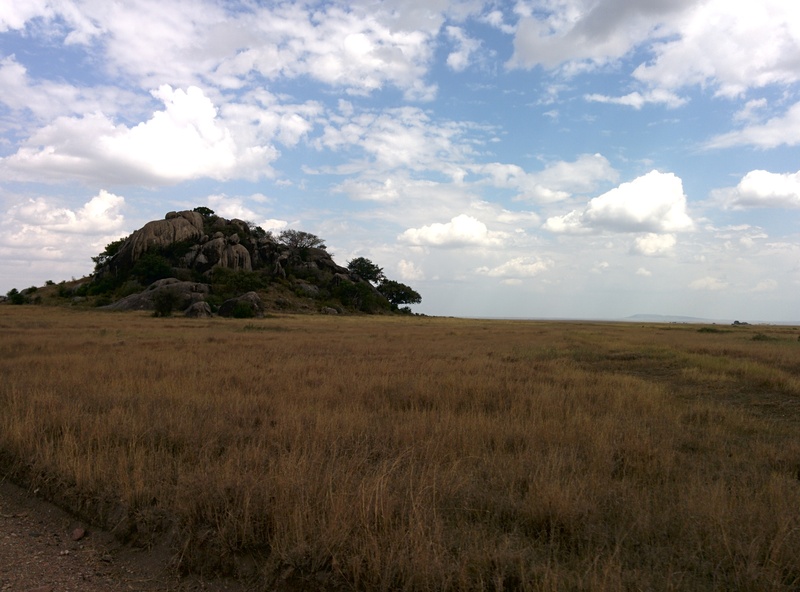 The Serengeti is the place where the story of The Lion King is set. But of course! We were there in June, at the end of the rain season. Nature was lush and green all around, and life was literally everywhere. 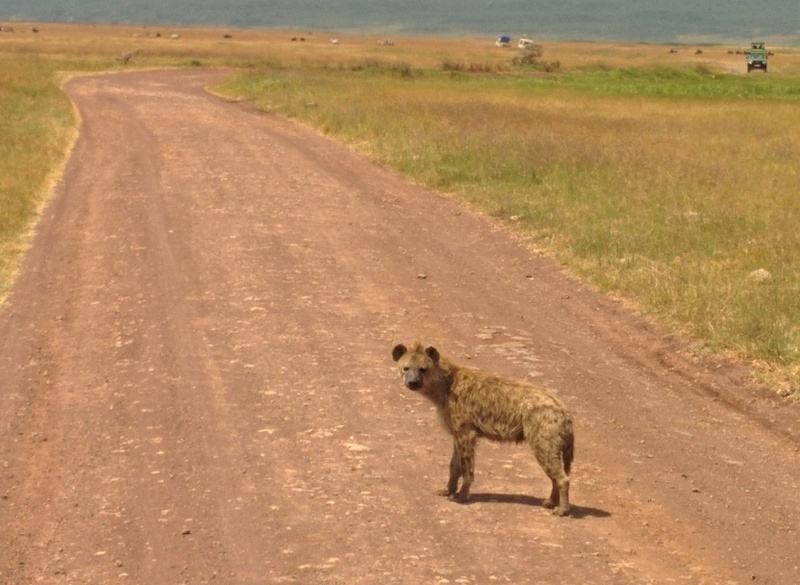 And shortly after entering the area, encounters with wildlife became very common. 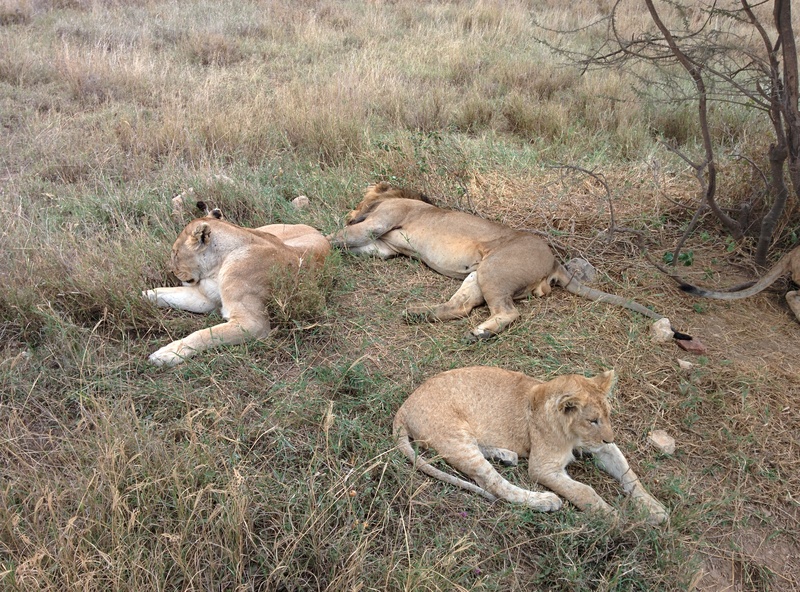 And after a short but torrential rain we were blessed with a close encounter with our first family of lions. They came to drink where we just passed with our car, a few minutes before. Fantastic! We were incredibly excited after our first encounter, not knowing that there would be much, much more. 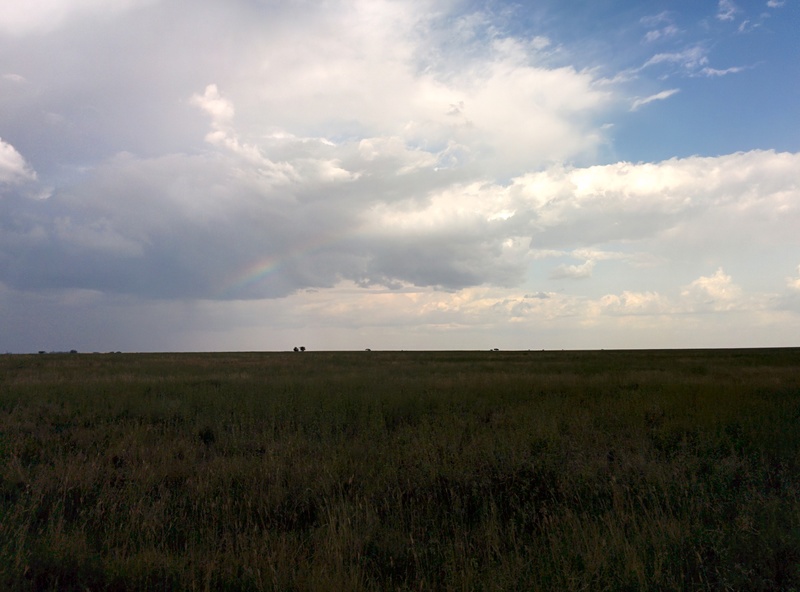 Wildlife is really incredibly abundant in the area, and that made me reflect on how disconnected from nature our life has become. The sky is always amazing in the equatorial regions. I wonder why: maybe it’s because… there is more of it? Due to the Earth curvature? I don’t know. Meeting a small herd of giraffes was also a very intense moment. 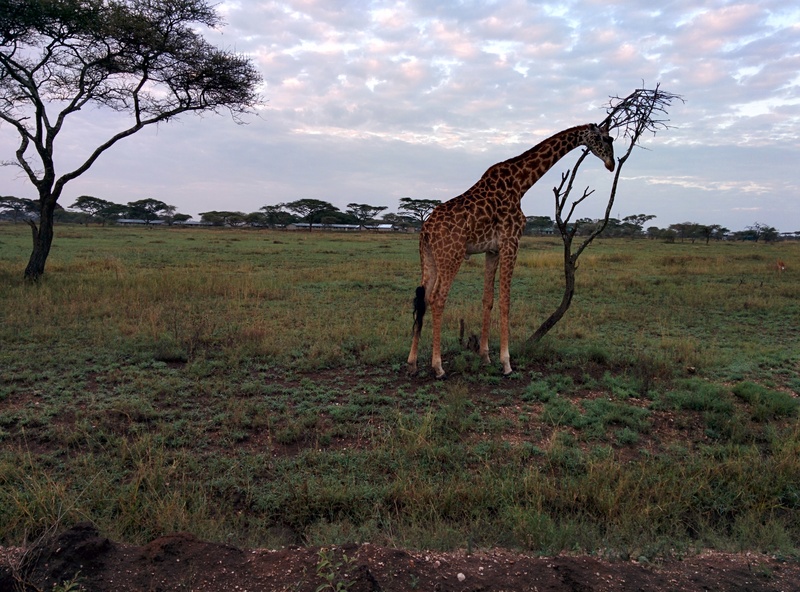 They eat peacefully from the tallest acacia trees and don’t seem to mind a close encounter with humans. If you look closely, you can spot a crocodile in the following picture. One of the most exciting moments of the day was the sighting of a rare cheetah. Guides are all connected in their network via radio, for safety reasons but also to share essential information. 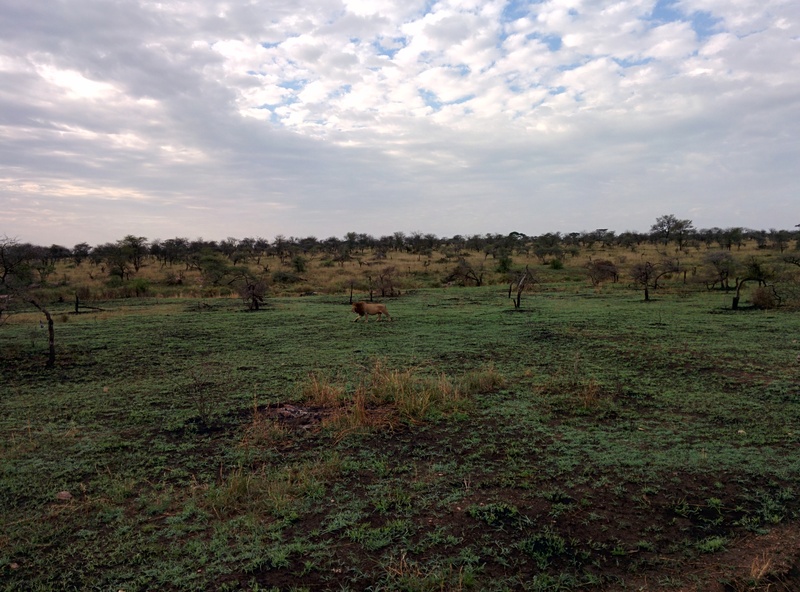 In this case, one guide saw the beautiful, very reclusive animal, and the word-by-mouth spread in a couple of minutes to all guides in the area. 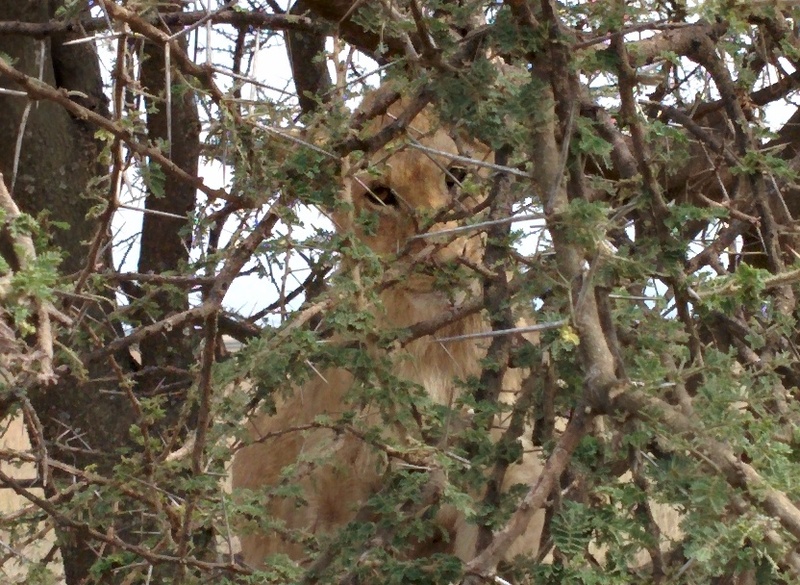 In case you don’t see it, the big cat is in the centre of the picture, sitting on a big branch. Quite disappointing, I know. 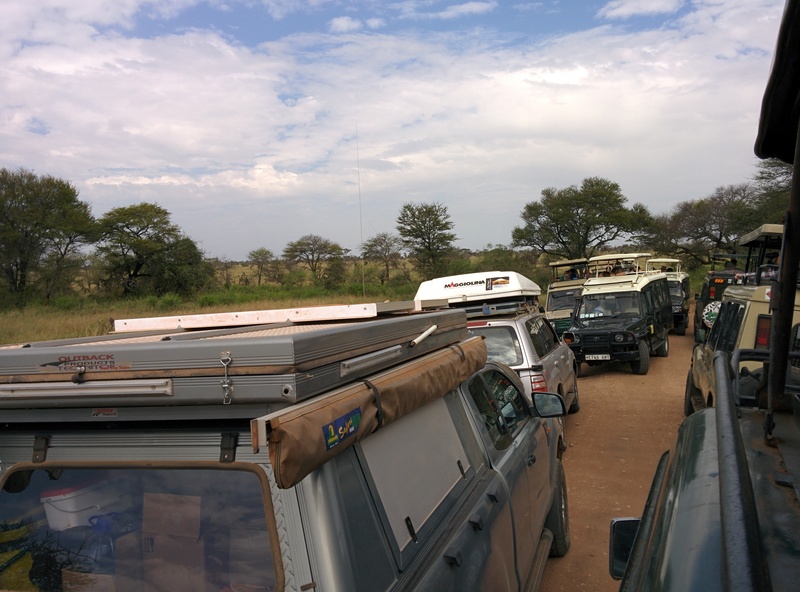 But this is also interesting: the huge line of jeeps that assembled there just to try to see the cheetah. 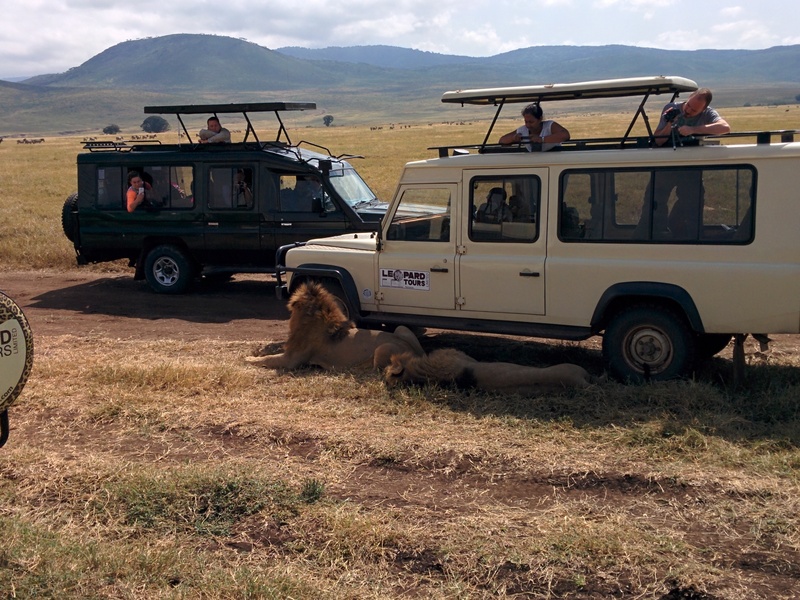 Of course the commercial side of the Safari industry is big, and its impact is impossible to ignore. All these people and resources were there, to take a picture of an animal… which didn’t want to be photographed! 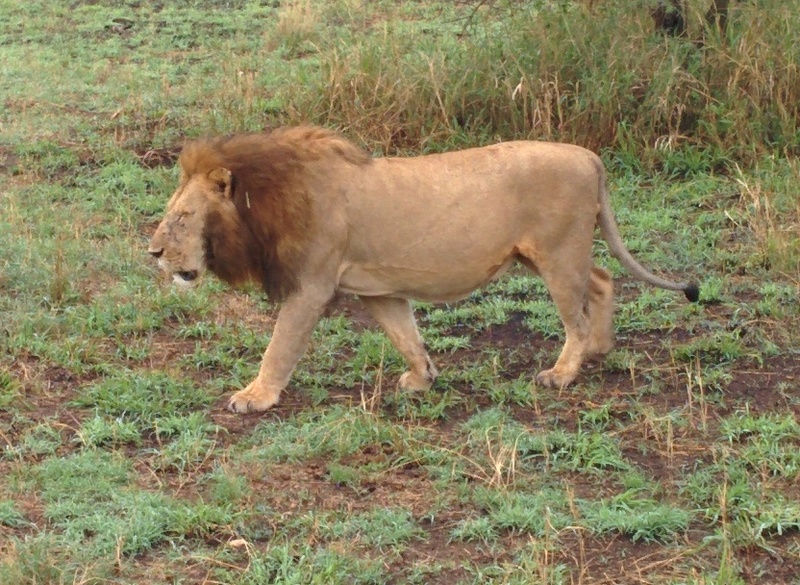 Finally, we met our first male lion. Alone. 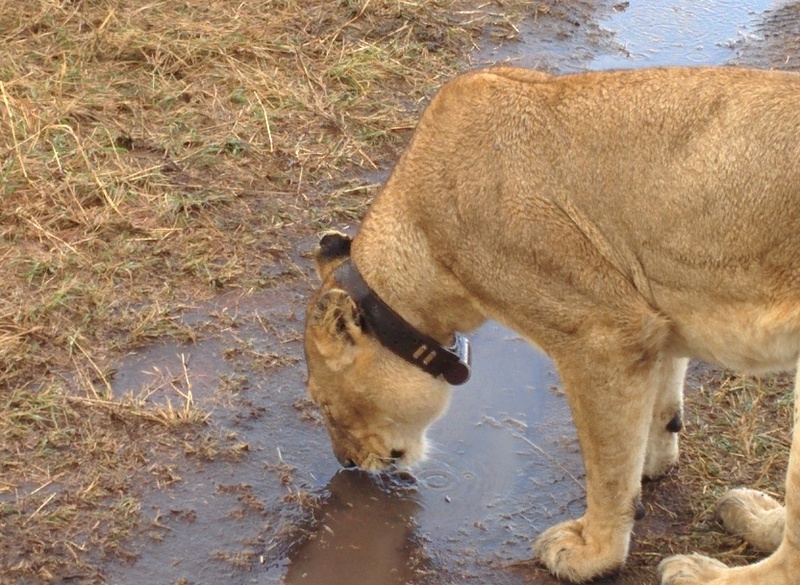 The name “King of the Jungle” is totally inappropriate, because lions don’t like jungles. But certainly there is something majestic in the way a big lion advances through the land (his land?). Seeing one in the natural habitat is an awe-inspiring experience. We were completely speechless as we were witnessing with wide-open eyes the wonderful event. Rock formations in the area have very distinct shapes. This is (supposedly) one that inspired the “Pride Rock” in the opening sequence in The Lion King. 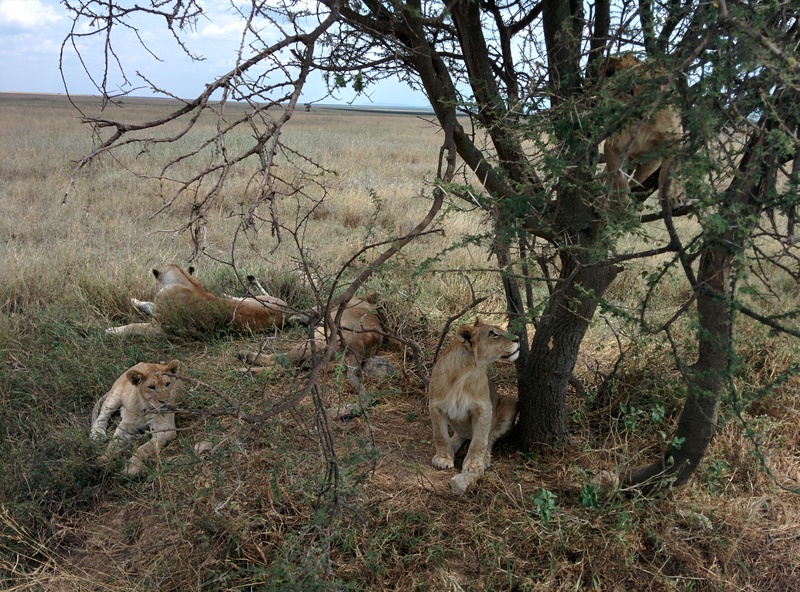 Not very far from it, we met a full family of lions, just chilling under a tree. What an incredible emotion! Lion cubs were playing around a tree. From near they really look like kittens. There is no difference in their behaviour, only in their size. 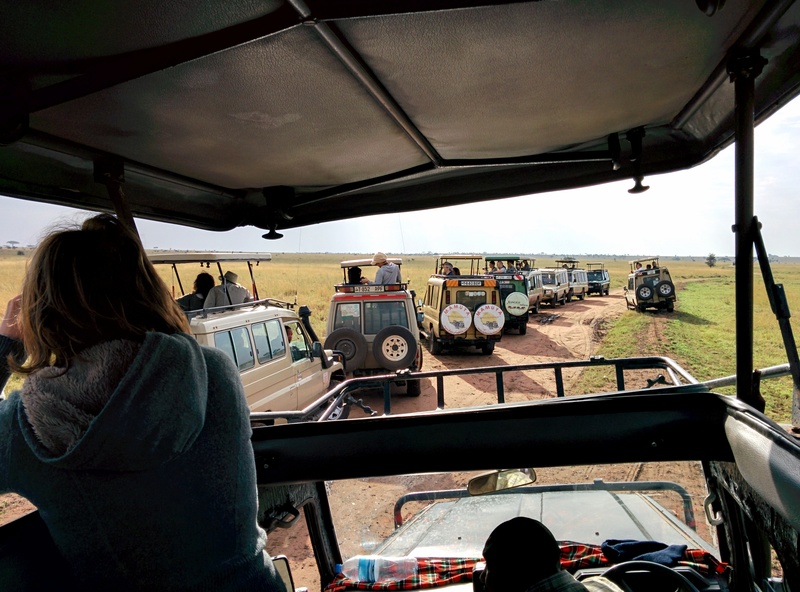 Overall we spent one day and one night in the Serengeti area. We pitched our tents in a camping area crowded with travellers (mostly western), right in the middle of the natural reserve. 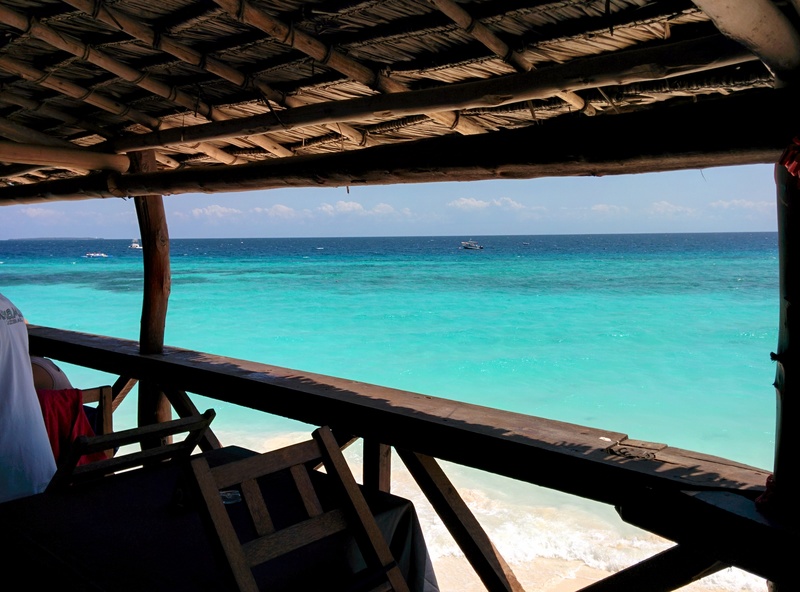 There are also other accommodation possibilities, including bungalows and luxury cottages, in order to satisfy all possible travellers with different budget needs. We were very happy with our solution. 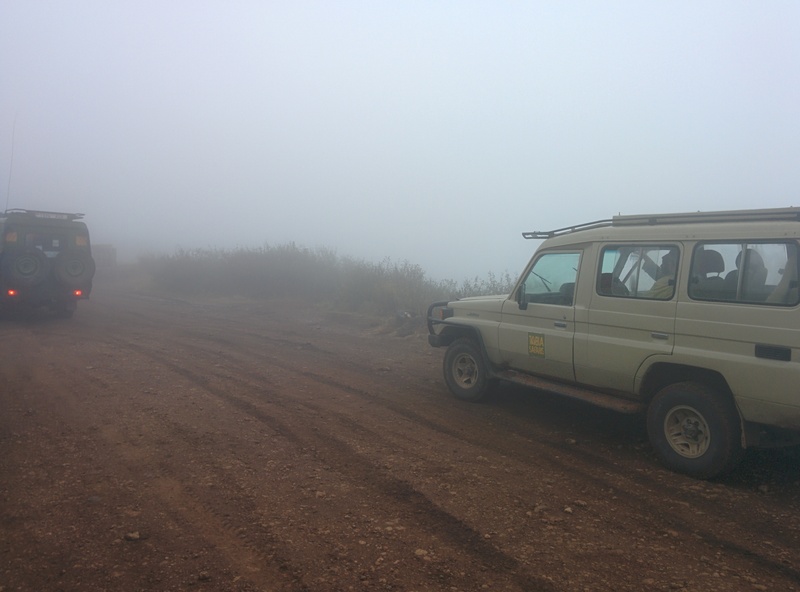 On the second day, we moved towards the Ngorongoro area. We camped again. 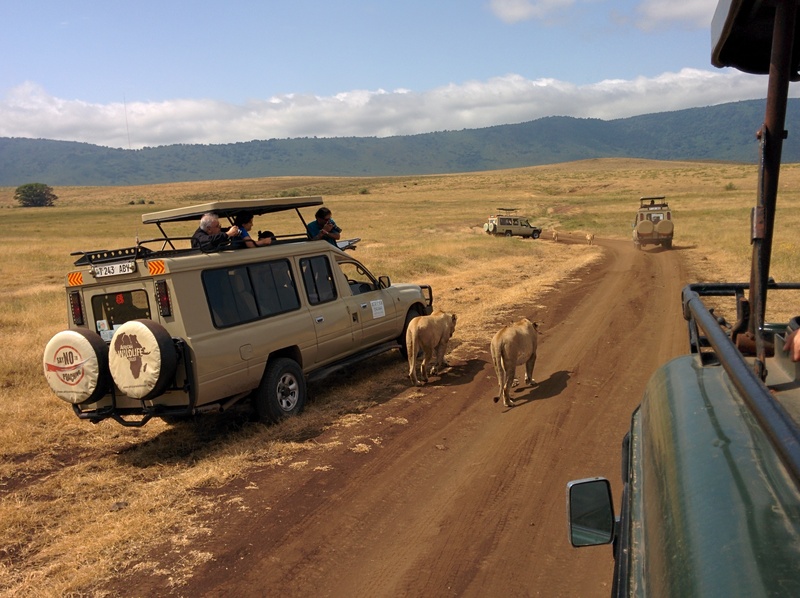 If Serengeti is considered one of the travel wonders of the world, Ngorongoro is probably on another planet. It’s an intact volcanic caldera, which exploded and collapsed on itself probably two or three million years ago. The result is an incredible habitat, protected by the natural walls of the crater (600 meters high), rich with all sorts of natural life. 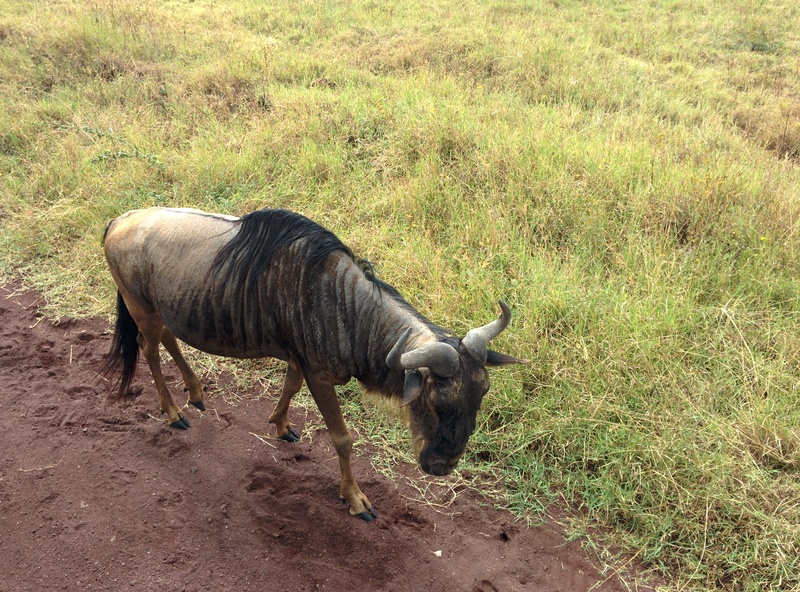 Including human: Masai are allowed to bring their cattle to graze in the crater, but cultivation is strictly forbidden at all levels. Moving early in the morning was a surreal experience. 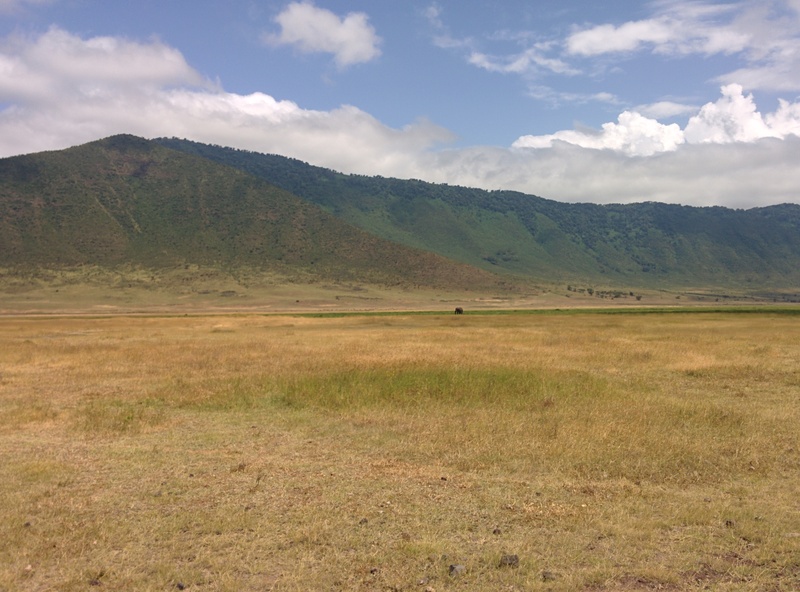 Ngorongoro is 1,800 metres above the sea level, and the climate is really mountainlike. You climb over the crater walls (another 600 metres, so nearly 2,500 metres of altitude), and then you can enter the natural park. Absolutely breath-taking. In front of our eyes there was an entire world in miniature. 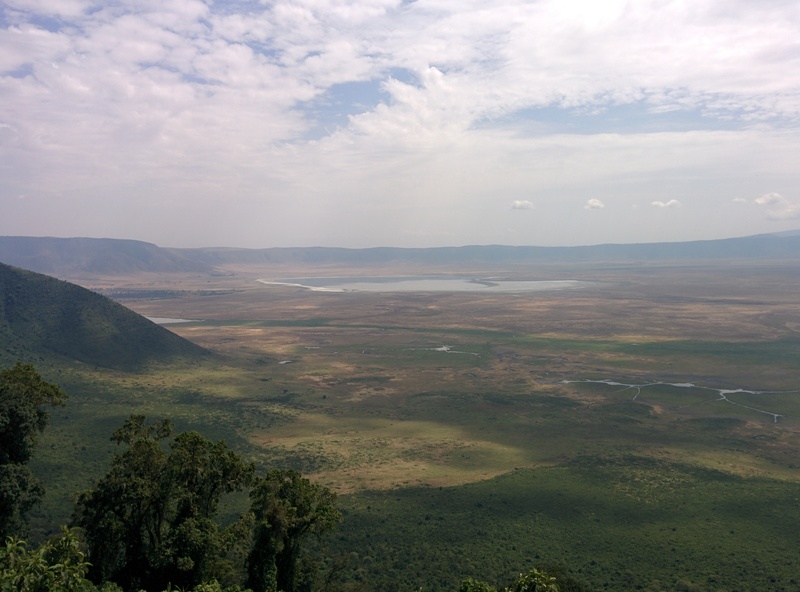 Even from the top of the crater we could see the landscape teeming with life. Are they elephants? Buffalos? We couldn’t wait to go and see in person. So exciting! 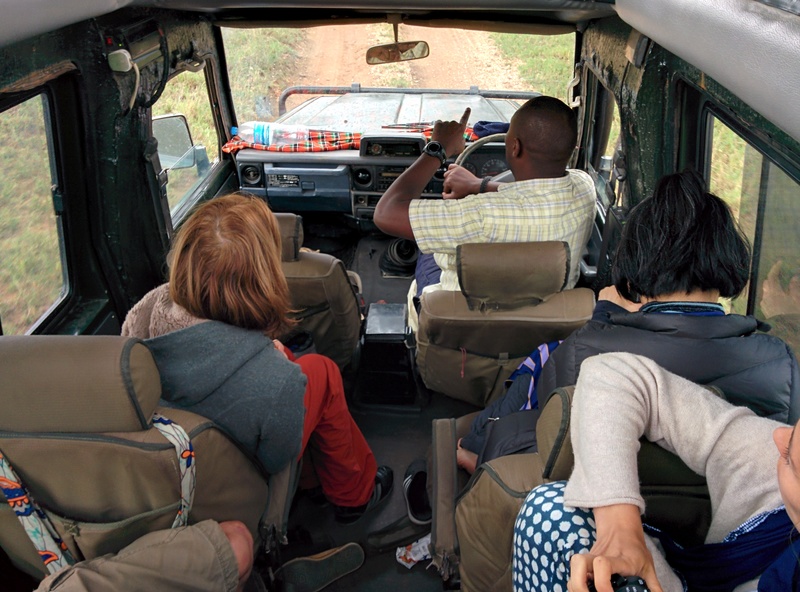 and then a sudden excitement happened – the guides are all connected via radio, for safety reasons but also to share important information – and we all started to rush in some sort of Safari race. What is happening? 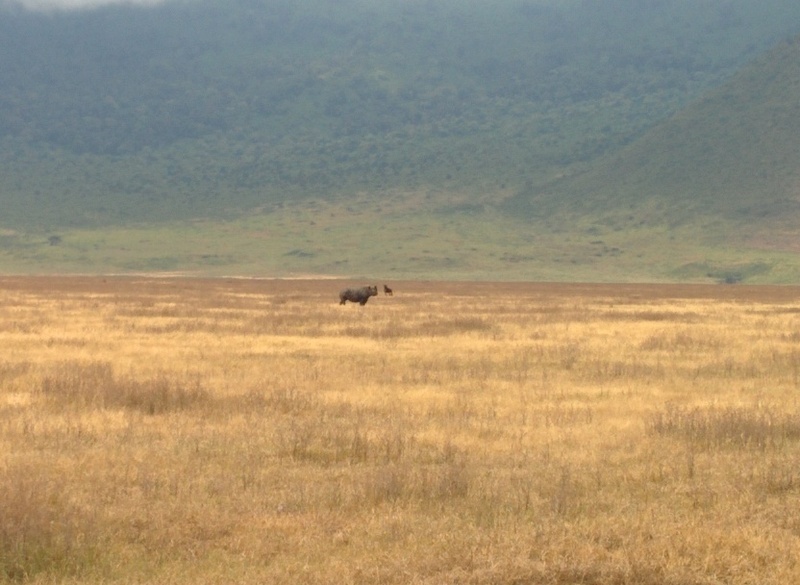 A black rhino had been sighted. So, again, all rush together and produce a traffic jam on the spot where the animal was sighted. It’s the dark side of the Safari. At least, this time I got a decent shot, even if very small and in the distance. Black rhinoceros, famous for the double horns, are severely endangered. Their population in the park is estimated to about 10-15 specimens. His close cousin, the West African black rhino, has been declared extinct in 2015. The main reason is poaching (illegal hunting). This fills me with an infinite sadness. Hunting is very controversial to start with, but poaching is simply shameful and horrible, full stop. 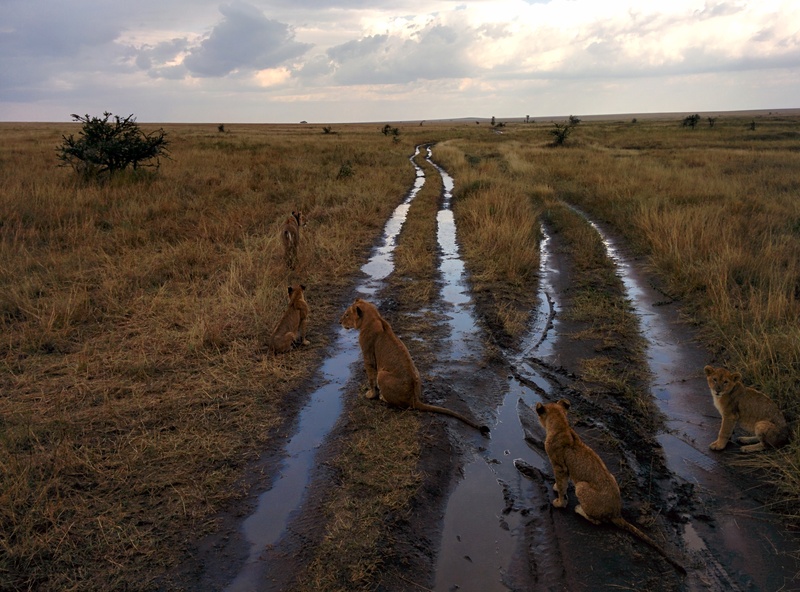 and then something really unexpected happened: another traffic jam was caused by lions, but in a… peculiar way. Yes, they stopped in the middle of the road and seemed happy to rest in the shade cast by the cars. Tourists and guides were obviously very happy about the unexpected encounter, but in this case the only thing you can do is to stop, and wait until the animals had enough and go away. Of course, getting off the car is a big no-no (accidents in these cases are not a remote possibility, the last victim was reported in 2015), nor you are supposed to blow horns or scare the animals away. We just learned to enjoy the moment, and waited. After all, we were the guests. And showed up uninvited. I have to say, our guides were very respectful of the environment and of all natural life there. 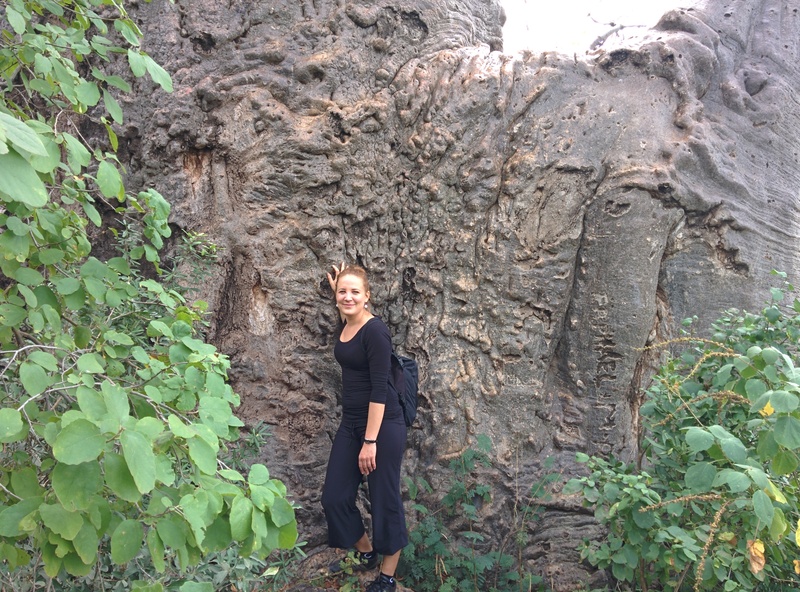 They seemed very aware that nature is a big economic resource for them and for Tanzania, but what I have witnessed was a sweet and authentic form of love and respect for it. Animals were seen and treated with respect, we were guests in their house, and we behaved as a consequence. Of course there are also guides with little or no scruples – stories of poachers that take pride in their last killing are common in media, and of course the average American dentist needs local guides to get his bloodied trophies – but I am proud to say that our guides were respectful, passionate and motivated people. In the end, I was really happy to meet them, to learn their stories, and to support their work. 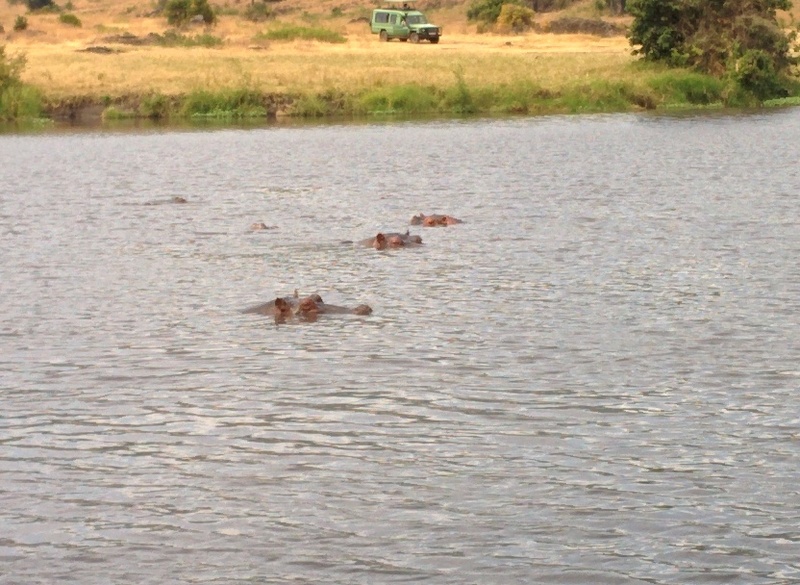 contrary to the use made in advertising and cartoons, hippos can be very aggressive. They have a very short temper and can charge and attack if they feel provoked (that is, often). In fact they are five times more dangerous than lions, and kill fifty times more humans than sharks! So whoever invented the expression “happy as a hippo” was delusional, and should get treatment very optimistic. Leave hippos alone if you can, they are not happy to meet you. 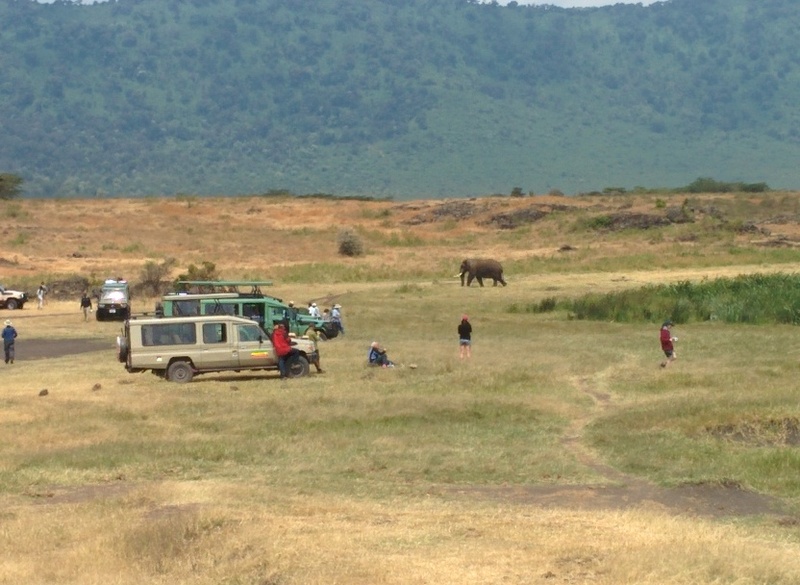 The camp was also visited by a huge male elephant who was just having his daily stroll there. It’s not at all a rare sight in the area. We met another one later in the afternoon. Sadly, but really full with experiences, it was time for us to go back. 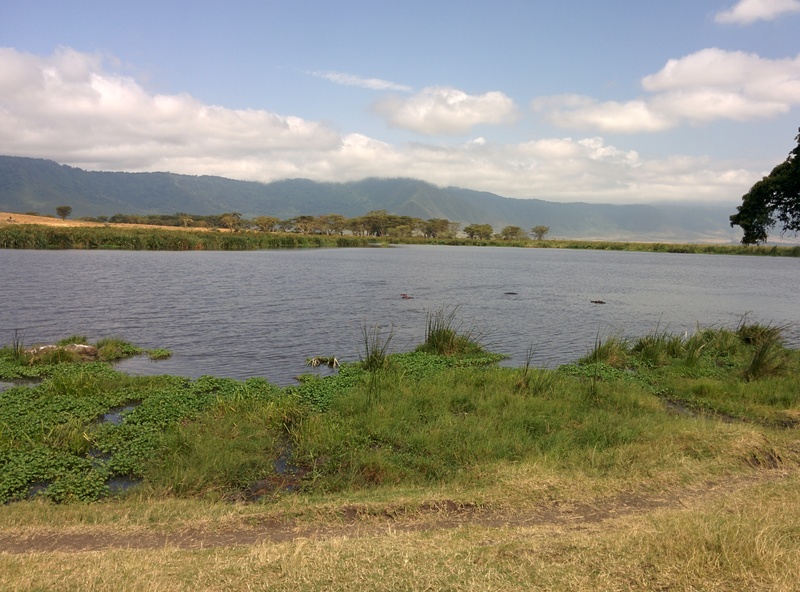 We camped in a bungalow this time, near lake Manyara, in a camping that offered a magnificent view of the area. 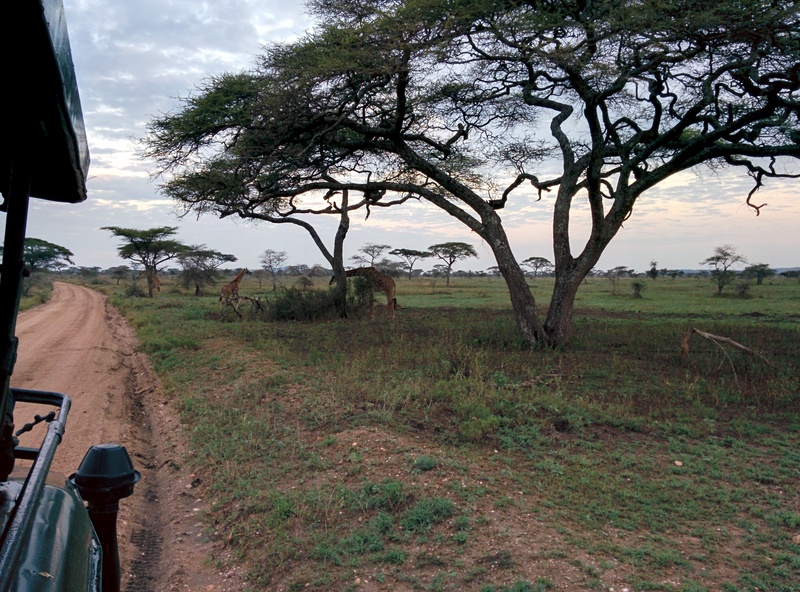 And the following day, tired of sitting in a car, we opted for a “walking safari” with a local guide. A different experience, but also really worth our time and money. 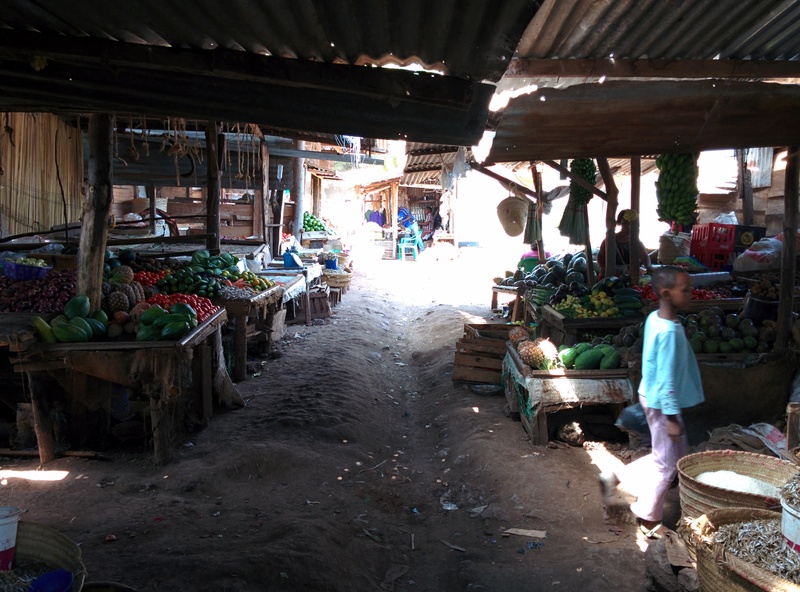 Slower, it allows for a better connection with nature and the local community, and if you are lucky (we were), the guide can be a neverending source of stories and local information. 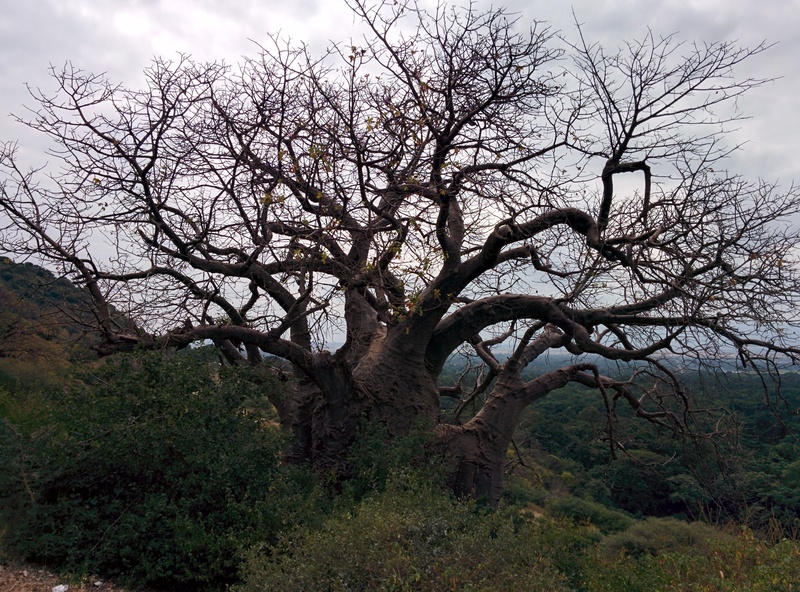 For example, THIS is a baobab. It looks big from a distance. But closer up, you realise it’s REALLY HUGE. 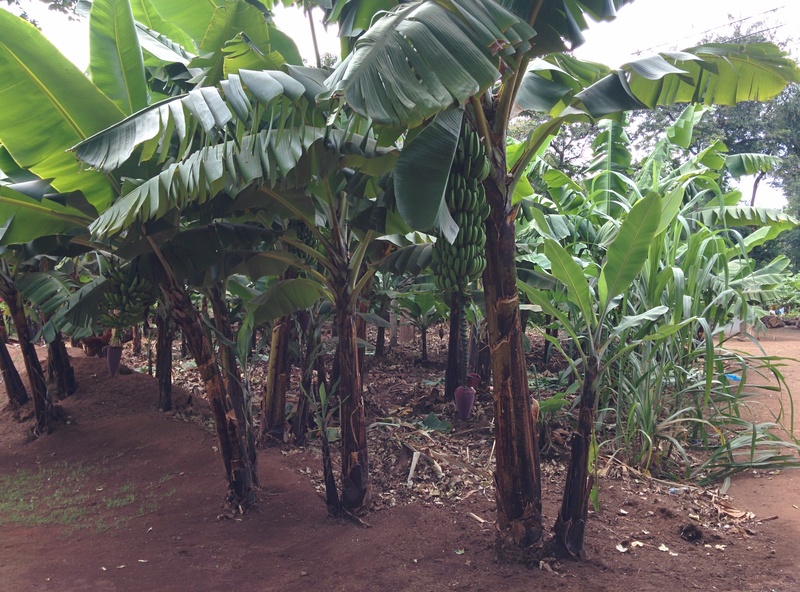 We could visit local plantations and learn about the history and society of Tanzania, the traditions, the life of the local people. 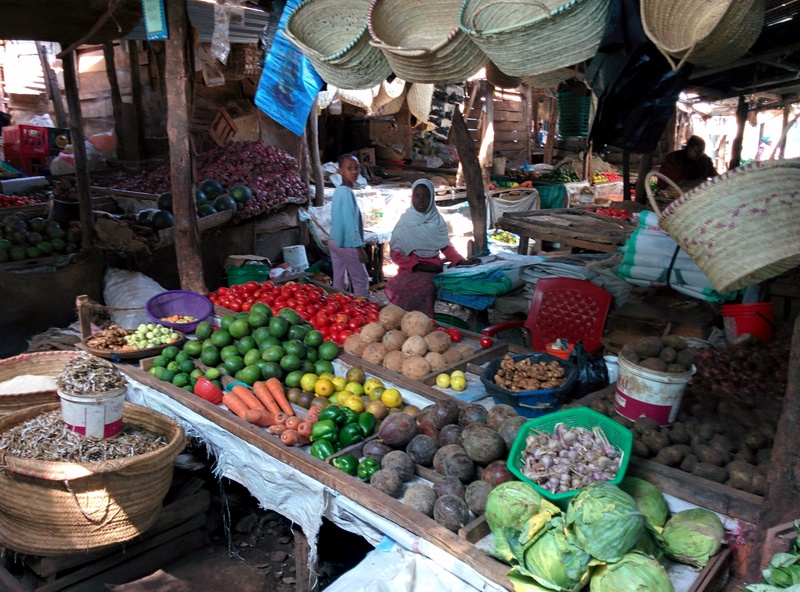 We also visited the local Masai market, which was a sensational cultural experience. 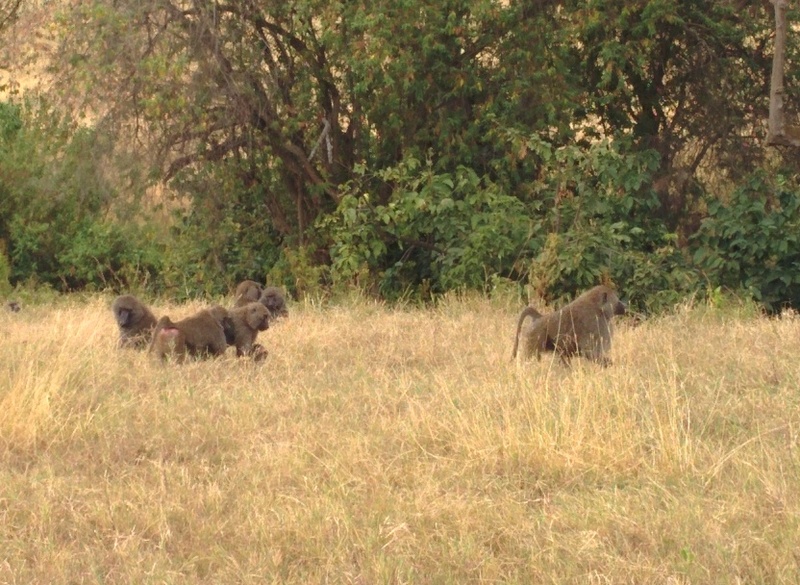 In the area near Manyara travellers are not infrequent, so people didn’t mind us too much. 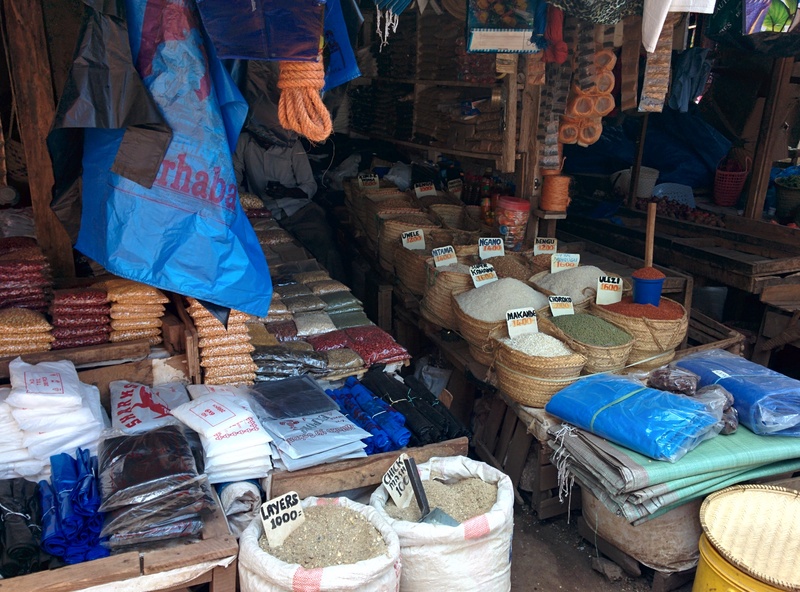 It was pleasant to visit the market just to have a look around. I bought myself a bagful of fruit, and I discovered a passion for chewing sugar cane. In Tanzania it was very common. In south-east Asia, as I later found out, it’s considered a barbarian custom. But as they say, this is another story. Thanks for reading and if you plan a similar journey, I hope you will find this story useful. 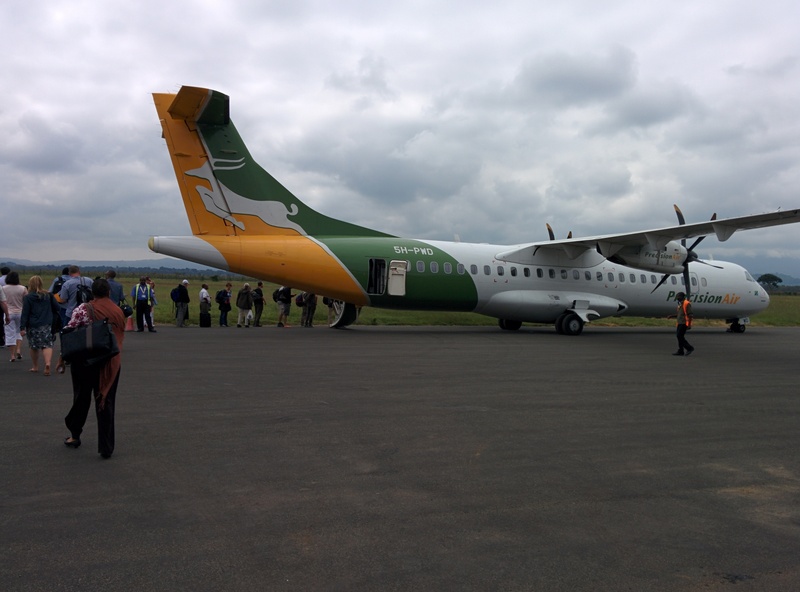 Safari njema!